Product #45895 | SKU B-62RM72-GB | 0.0 (no ratings yet) Thanks for your rating! 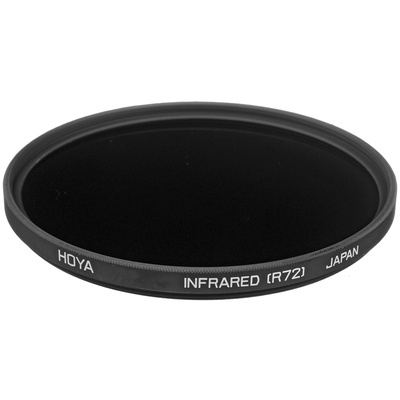 The Hoya 62mm R72 Infrared Filter is a specialised filter used for infrared photography with digital cameras and specialised infrared film. This nearly opaque filter blocks all visible light up to 720nm, enabling recording of subject matter and scenes that are not visible under normal conditions. Due to the nature of infrared photography, the filter factor for this filter is highly variable and depends largely on the ISO sensitivity in use and lighting conditions. This filter is constructed from high-quality optical glass and is set in an aluminium filter ring to provide increased rigidity and prevention from filter jamming. Used for infrared photography applications with digital cameras and specialised IR film. Can be paired with coloured black and white contrast filters to change the coloured or contrast effects with this filter.